Hot glue a plastic plant to the bottom of the inside of the mason jar. Add a handful or two of aquarium gravel until the bottom of the jar is completely covered. An adult should take a sewing needle and hold it over an open flame for just a few seconds. Then, puncture a small hole into the top fin of one of your plastic fish. This is done so that you can thread fishing line through it. Thread the fishing line through the hole in the toy fish. Measure out your fishing line to make sure your fish hangs at the desired height. Place a small dot of hot glue on the bottom of your mason jar lid, and set a loop of the fishing line in the glue. Put another dot of glue on top of the loop to secure it. Once the glue is dried, cut off any excess fishing line. Now the fish hangs from the lid. Fill your mason jar with colored water. 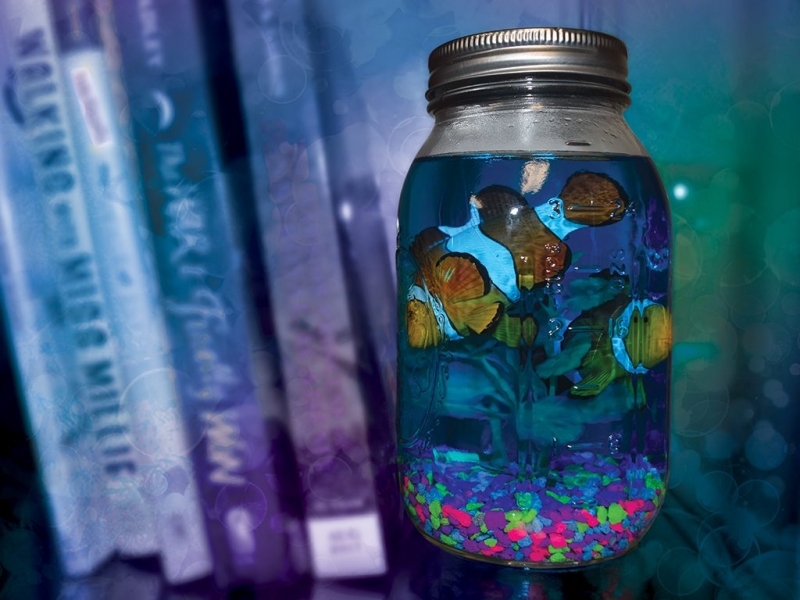 Place the hanging fish inside the jar, and screw on the lid.